We all know it's been hot this summer. You don't need us to remind you of that on a daily basis. That's what the sweat stains on your dress shirts are for. But as the season changes from summer to fall, it's a good time to take a look back at what we've experienced so far and put it in some kind of perspective. For that, we bring in NBC4 meteorologist Tom Kierein. His findings? This has been the hottest year on record (so far) in Washington, D.C. The average temperature for the year through August has been 61.9 degrees. September is currently running about 4 degrees above average, so the average for the year should only go up. The previous hottest year was 1991, which had an average temperature of 60.2 degrees. Granted, we could experience much cooler weather the rest of the year to bump down our current average, but for now, we're on a record-breaking pace. This we know: 2010 was the hottest summer on record in D.C. The average temperature in June, July and August was 81.3 degrees. The previous record was set in 1980, when the three-month average was 79.9 degrees. 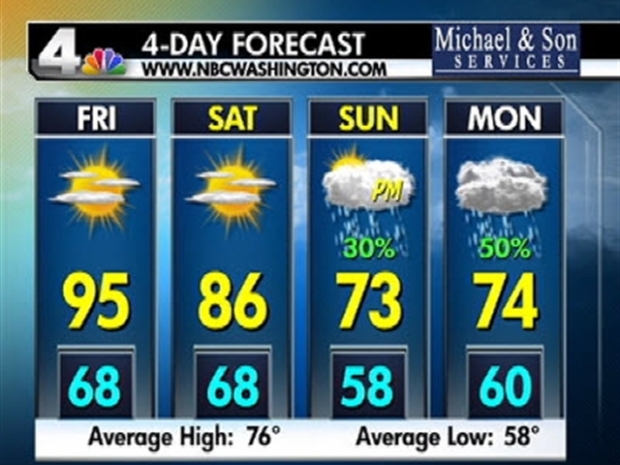 We've also had 65 90-degree days so far this year in D.C., with Friday probably making No. 66. The average number per year: 38. The record number of 90-degree days was also set in 1980 at 67. So there's a chance we'll break that record this year. Not only has it been hot this summer, it's also been dry. So far, this September has been a parched month. That means seven of the last nine months have been drier than normal. For the year, we're 7.26 inches of precipitation below normal. But wait, you say, how can that be? Didn't we have blizzards this year that dropped a copious amount of snow on our area? Memory serves you correctly. We did endure those blizzards, bringing a striking contrast to our weather patterns this year. Not only is this turning out to possibly be the hottest year on record in D.C., but it is also included the snowiest winter on record. We had 56.1 inches of snow this past winter, blowing away the old record of 54.4 inches set in 1898-99. How the heck is all of this possible? "It's a classic example of how the atmosphere is constantly trying to achieve a balance," Kierein said. "Excess temperatures or precipitation for a period of time is usually followed by a deficit. Sometimes it's not the same year or the following year, but over time we achieve a general balance." That being said, Kierein points out that it looks like a La Nina is developing for this coming winter. A La Nina means there is an abnormal cooling of the eastern Pacific waters. "Most of the winters we've had during a La Nina period, we've had above-average snowfall," Kierein said. "So there is a chance for another snowy winter in 2010-11." Makes sense, really, since we've been so dry. It's all about Mother Nature trying to achieve that balance.